When people think about the birds of South America they automatically envisions the more tropical birds such as toucans and parrots. Ecuador has its share of these exotic birds in various sizes and colors. 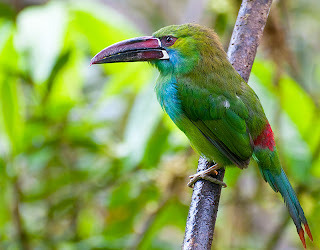 Though not the smallest, the Crimson-rumped Toucanet is definitely on the more diminutive end of the spectrum. Toucans are spectacularly colored birds that inhabit the humid and mountain forests of South America. They make their nests in holes in trees and have the curious ability to fold their tails flat onto their backs when roosting. Toucans are an exceptionally vocal bird producing squawks, grunts, croaks and squeaks that give their presence away. Although primarily fruit-eaters, they will occasionally partake in a more protein rich diet of insects as well as the eggs or nestlings of other birds. The Crimson-rumped Toucanet (Aulacorhynchus haematopygus) is quite common on the western slopes of the Ecuadorian Andes ranging from the Columbian border south to western Loja. It generally resides between 500m and 2,000m (1,600 ft. and 6,600 ft.) although it has been known to visit some lower areas. There were reports years ago of spotting the Crimson-rumped Toucanet on the eastern slopes but there have not been any sightings in recent years. This compact toucan is 34.5 – 35.5 cm in length (13 ½ - 14 in.) and has a bill of 6.5 – 7.5 cm (2 ½ - 3 in.). The beak is a dark red in color mottled with black. Red eyes peer out from a predominantly green body. A bluish tint can be seen below the eyes and across the breast in the attached photo but this is generally not noticeable in the field. There is a narrow band of red across the rump that may not be seen when the bird is at rest. The tail feathers have a chestnut colored tip. Although toucans can be rather shy, there are areas that you can visit where you can approach these birds for a closer look. The attached photo was taken at Paz de las Aves, a private reserve north of the town of Mindo. Angel Paz has erected some hides and feeders in the canopy of the forest to attract the Crimson-rumped Toucanet as well as other exotic species. Other areas where this tropical jewel can be observed are Bellavista Forest Reserve, Buenaventura Reserve, Milpe Bird Sanctuary, Mindo Valley, Rio Canande Reserve, Rio Palenque Reserve, Rio Silanche Bird Sanctuary, Tinalandia and Tandayapa Valley. The Crimson-rumped Tucanet is an adorable little bird that is a delight to observe and photograph. Look closely and you may be rewarded with a few moments with this precious gem of the rainforest.